Learn how to make the best vegan cheesecake ever! No, really! This cheesecake is light, creamy and smooth with no dairy or nuts. Plus, it’s easy to make and you don’t need a high powered blender! It took me a couple of failed attempts to finally succeed with this recipe. Well, my husband says my failures are still good, but they are garbage compared to this cheesecake! 😉 I tried a recipe using cashews, and it ended up so dense and thick, and almost gummy in texture. Nope, not what I was going for. I decided it would be kind of fun to make this recipe without nuts at all, so if you have a nut allergy, rejoice! This one’s for you. I also like that with this vegan cheesecake, you don’t need a high powered blender to make the filling. A simple hand mixer will do, though I used my stand mixer. I do have a couple other cheesecake recipes on my website. If you want a raw version, try this No Bake Raspberry Layered Cheesecake, it’s very tasty. Or this Double Layer Pumpkin Cheesecake, a holiday favorite. 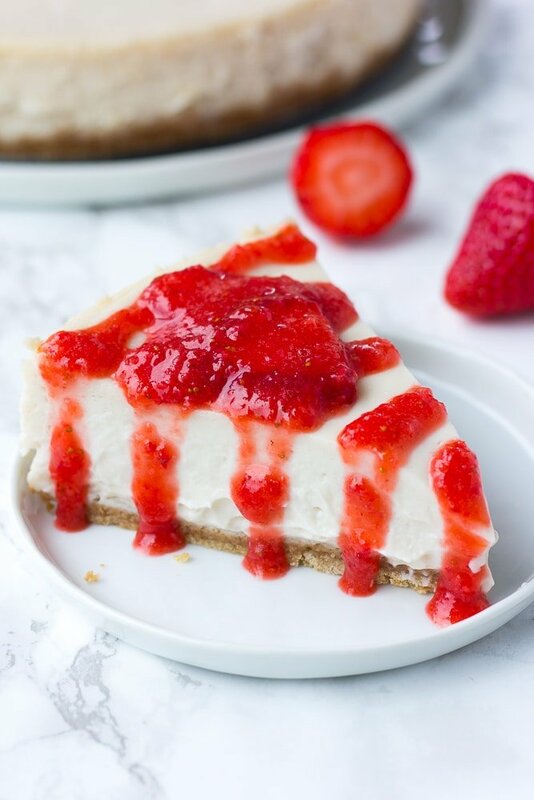 HOW DO YOU MAKE THE BEST VEGAN CHEESECAKE? Prepare a 9 inch springform pan by wrapping the bottom and sides with aluminum foil. Put a piece of parchment paper in the bottom, and spray with oil. Preheat the oven to 350 degrees F.
Make the crust with vegan graham crackers, coconut oil and sugar. Simply mix them together, and press into the pan. *Most graham crackers have honey, but Nabisco graham crackers do not. If you can’t find those, you can use vegan gingersnap cookies or another similar vegan cookie. Now make the filling. First, beat the vegan cream cheese until smooth. I used Trader Joe’s brand which I love, but you can use another brand as long as it’s unflavored of course. Then, add the rest of the filling ingredients (coconut cream, sugar, cornstarch, vanilla, and lemon juice), and beat until very smooth. Yes, I know it’s a LOT of vegan cream cheese, but this makes a large cheesecake! You will have 12 good sized slices. It’s perfect for holiday get togethers or birthday parties. Pour the smooth filling over the crust and spread it evenly. Below in the photo you can see how the foil should look around and under the pan. Before putting it in the oven, place the cheesecake on a large pan, and add warm water about halfway up. This is your water bath and will prevent cracking. I know, I know, this really freaked me out about making cheesecakes, but it’s easy! Trust me. Bake for 50 minutes, turn off the heat and let sit in the oven without opening the door for another 10 minutes. It will look jiggly and undercooked in the middle, but don’t worry. It will firm up wonderfully after cooling. Chill in the fridge for at least 4 hours, preferably overnight. I would recommend you plan ahead and make this a day in advance for parties or events. It will cut down on a lot of stress! This vegan cheesecake is easy to make but it does cook for a long time and has to cool for a very long time. It will be worth it. 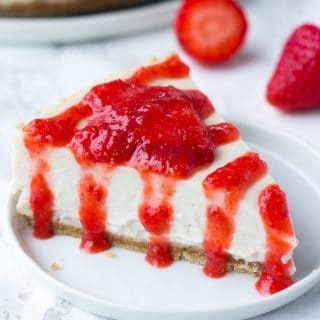 WHAT IS THE BEST WAY TO SLICE CHEESECAKE? 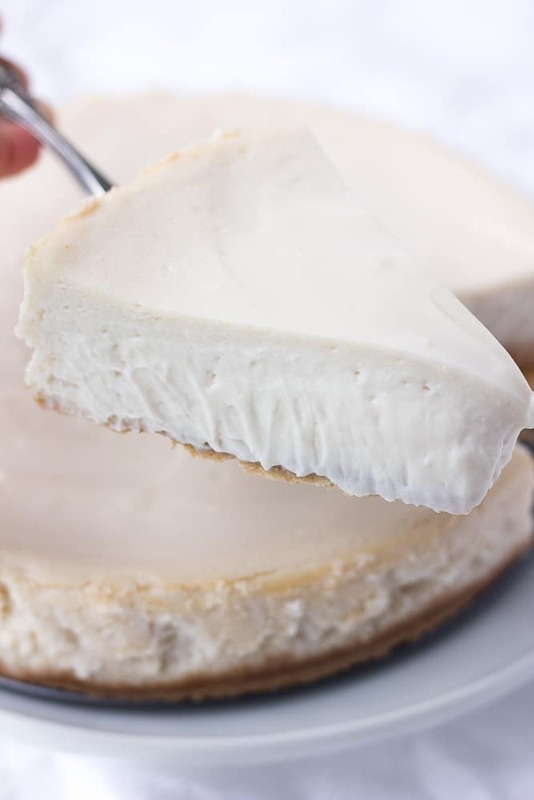 After cooling overnight or at least 4 hours, take the cheesecake out of the refrigerator. Carefully run a knife around the edges, then slowly release the spring. Run a large, sharp knife under hot water, wipe dry with a clean towel, and then slice. Repeat with each slice for very clean cut pieces of cheesecake. Serve with optional fresh strawberry sauce, vegan caramel sauce, coconut whip cream or just plain as is. Enjoy! 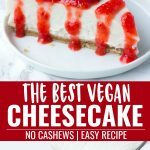 Learn how to make the best vegan cheesecake ever! No, really! This cheesecake is light, creamy and smooth with no dairy or nuts. Plus, it's easy to make and you don't need a high powered blender! Preheat the oven to 350 degrees F. Wrap a 9 inch springform pan with 1-2 layers of aluminum foil, covering the bottom and the sides (see photos for reference). Cut a circle of parchment paper for the bottom of the pan, and spray lightly with oil. In a medium bowl, add the cookie crumbs, melted coconut oil and sugar. Stir well to combine, then press down into the bottom of the prepared pan. Press down firm and evenly. Set aside. 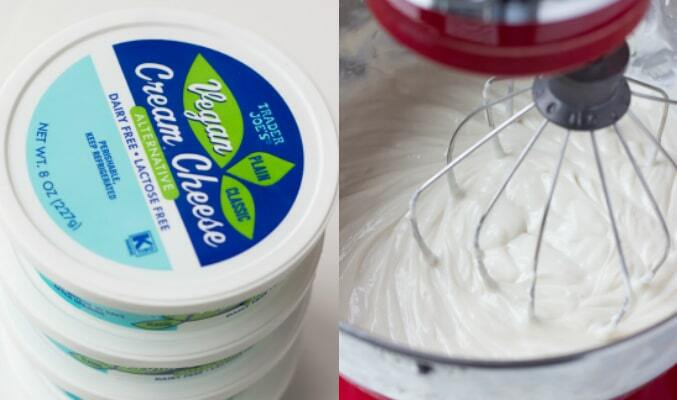 In the bowl of an electric mixer with the whisk attachment, or using a handheld mixer, beat the vegan cream cheese until smooth, about 1 minute. Now add the rest of the filling ingredients and beat until smooth, scraping down the sides and bottom of the bowl as needed. Once it's completely smooth, pour into prepared pan over the crust and spread evenly. 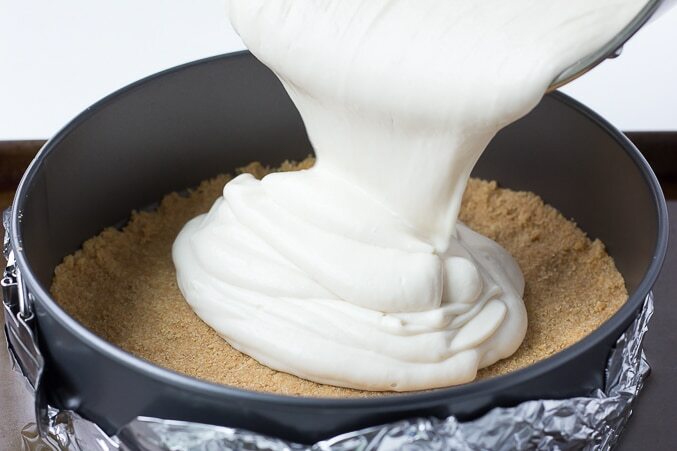 Place the cheesecake onto a large pan, filled about halfway with warm water. This is your water bath, and will help prevent the cheesecake from cracking. Place in the oven and bake for 50 minutes. Do not open the oven door during this time. Turn off the heat, and let it sit in the oven for 10 more minutes. The cheesecake will be slightly jiggly, and not look very done in the middle. Remove from the oven, and let it cool for about 15 minutes at room temperature before moving to the refrigerator to cool for at least 4 hours, preferably overnight, before slicing and serving. When ready to serve, slice and serve with fresh strawberry sauce, if desired. In a food processor, add 1 1/4 cups of the sliced strawberries (reserving 1/4 cup), sugar and lemon zest. Process until smooth. Toss with the sliced strawberries in a small bowl and chill for at least an hour before serving. Most graham crackers have honey, but Nabisco brand is vegan if you can find it or order it online. If not, you can also use vegan gingersnap cookies or another similar cookie. 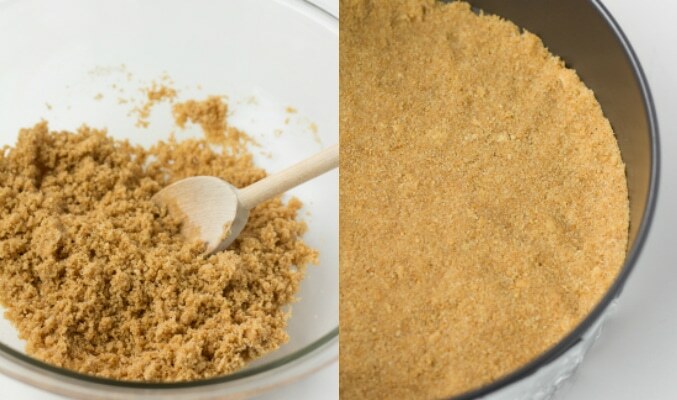 Just simply add them to a blender/food processor and then measure 1 1/2 cups crumbs. You can use melted vegan butter in place of coconut oil if desired, for the crust. If you can not find canned coconut cream, you can use 1 can of full fat coconut milk, just don't use the light coconut milk. If you don't have a springform pan, it should work in a regular pie pan, if it's big enough (9-10 inch). But it's much more fun in a springform pan! Amazing!!! I couldn’t believe this was vegan. Tasted like the best cheesecake, vegan or otherwise! I’d love to know what the ingredients are in the vegan cream cheese from Trader Joe’s. Does anyone know? Thanks!! If you google it, you can find a photo of the ingredient list. But the first couple of ingredients are filtered water, coconut oil, sunflower oil, soy protein concentrate and cornstarch. There’s a few more after that. When do I remove the cheesecake from the water bath? When you remove it from the oven after baking. Often by this time the water is evaporated for me anyhow. Hope that helps! I just took mine out of the oven and it is VERY jiggly and appears to have a layer of the coconut oil around the edges. I followed the recipe to a T, I’m not sure what happened. I’m hoping when it cools it will be better. Any ideas on what happened or if this is normal? That sounds about right actually. Just continue to follow the instructions and cool for at least 4 hours, preferably overnight. I’m confused on the water bath part, what do you mean exactly by that? Thank you & happy holidays! I just made this and took it out of the oven . It’s really jiggly I feel like maybe a little too jiggly lol I wonder if it’s because I used the whole fat coconut milk instead of cream ? Also how long should I let it cool on the counter before putting it in the fridge and also do you cover it with plastic wrap whilst cooling /setting in the fridge? Hi Ashley! It’s normal for it to be pretty jiggly and look uncooked in the middle. If you cooked it the full time it should be just fine. It’s firms up a LOT as it cools in the refrigerator. Leave it on the counter for about 15 minutes, then transfer it to the fridge. I usually do cover it. In my springform pan, I can cover it with plastic wrap without having the wrap touch the top of the cheesecake. If you used a regular pie pan, I wouldn’t cover it because the plastic wrap will touch the top and potentially ruin it. Hope that helps! Can I make these into individual little cheesecakes in a cupcake pan? I think that would work, yes. I haven’t tried it but I’m sure it would work. You would bake them for much less time, I imagine though. Sounds fun! I made this cheesecake for my family who is far from vegan and they absolutely loved it! 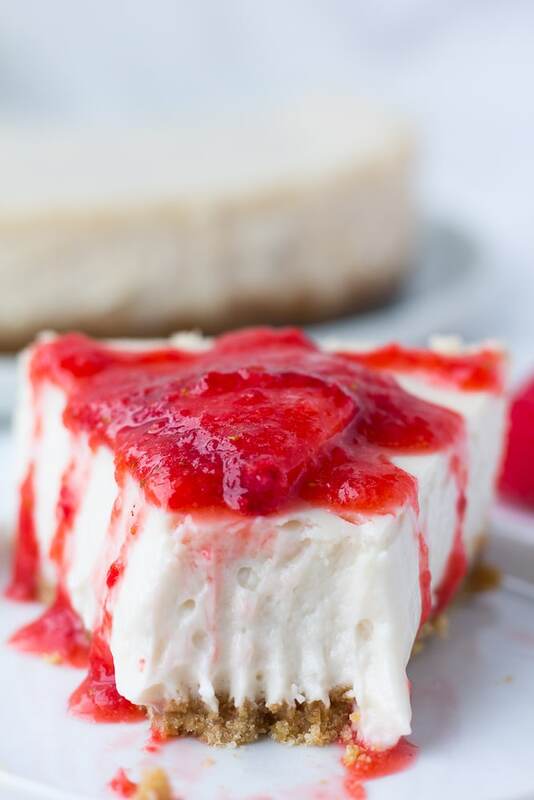 It truly is one of the tastiest cheesecake recipes that I have ever made! It turned out beautifully and the strawberry glaze was the perfect topping, sweet, light & delicious! Looking forward to making this cheesecake again & experimenting with different toppings and flavors!! 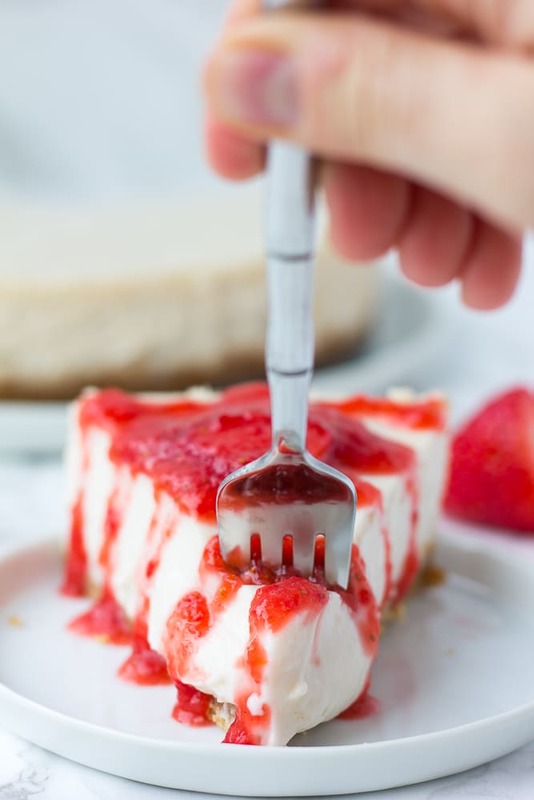 I’m sorry and also a bit late to the party; but, “how do you slice a cheesecake?” Um, I generally just use a fork until I can’t lift it to my mouth any longer. LOL I totally hear you!